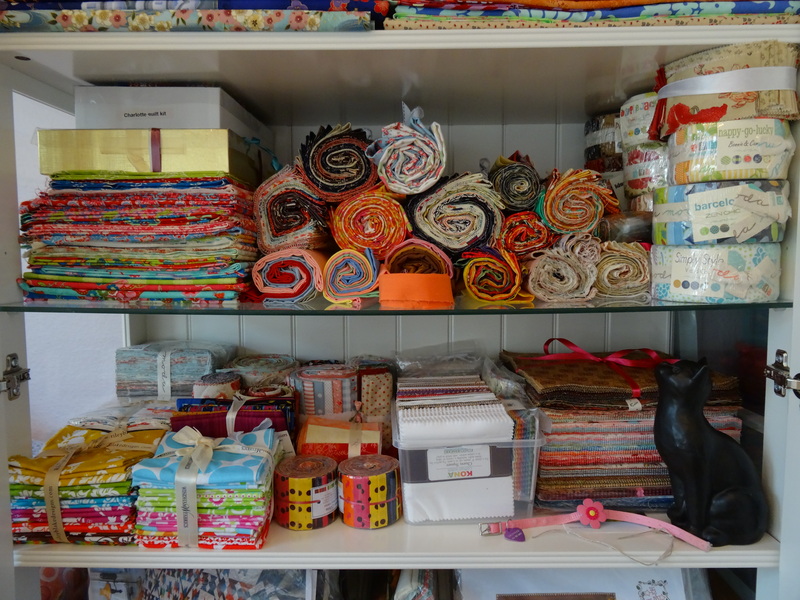 Over the winter months, I tend to do less dressmaking. In the summer I love wearing flirty skirts and pretty sundresses, both of which are fun to make, but during the winter I usually feel less inspired. I’ve been working on the same dress for a couple of months now. It’s a simple shift dress, made from an off-cut of beautiful grey wool which I picked up for a song in New York back around Thanksgiving, and I’m lining it with a gorgeous turquoise coloured satin. The dress is coming along well – all that’s really left to do is line and hem it – and if I like the end result, I’m planning to use the same pattern to make a dress to wear to Miss S and Mr E’s wedding in May, using some glorious pale blue French linen I bought in Paris a few weeks back. I’m back in the UK at the moment (hopefully the skirts will still fit by the time I get back home! ), but now I’m absolutely raring to go with the sundress and my wedding outfit for May. And I’m pretty sure that when I do get started next week, I will have plenty of ‘help’ from my chief sewing assistant, Mr. Boy. 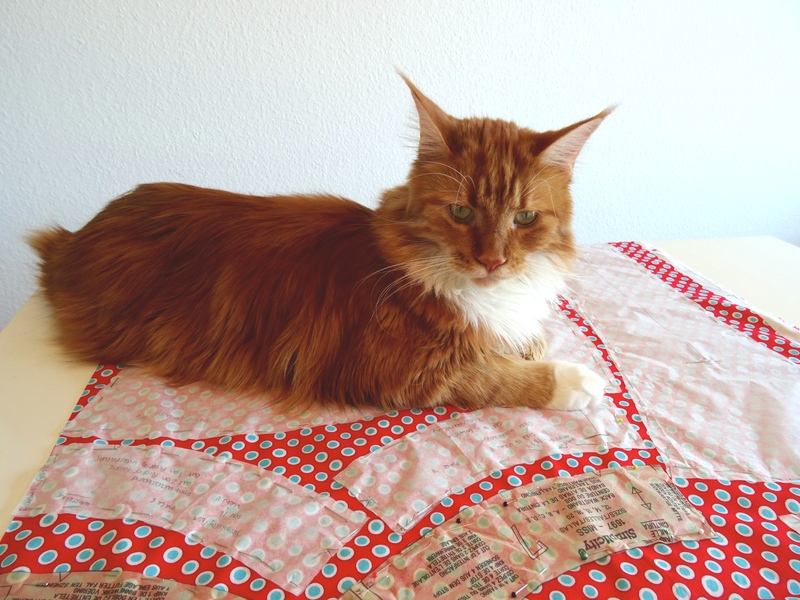 Whilst Mimi Bubba likes to help me quilt, usually by plonking her not insubstantial bulk on top of whatever I happen to be piecing or quilting, Mr. Boy prefers to help out with dressmaking. And his favourite activities to help with are stealing tape measures and lying on top of crinkly-sounding pattern paper. What a helpful boy! It’s a good thing I love him, isn’t it?! 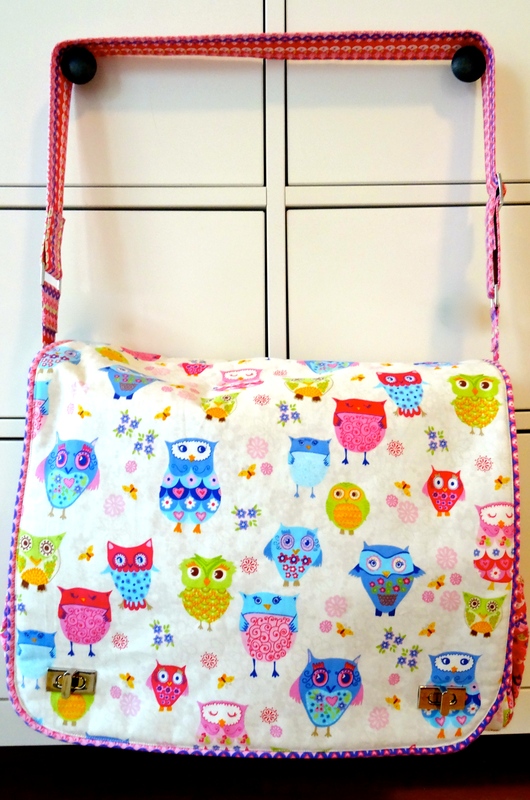 Whole Lotta Bag – finished and fantastic! 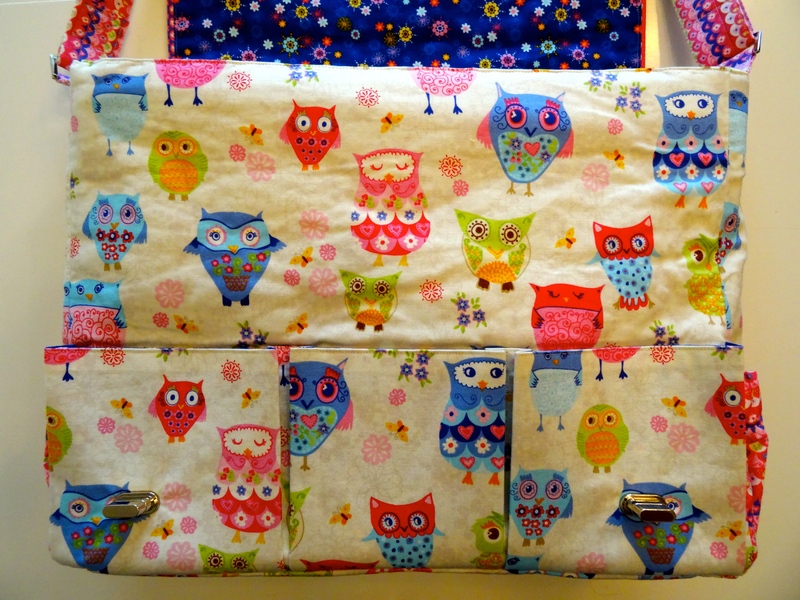 I love owls, and these were so cute, not to mention the beautiful purple and pink co-ordinating fabrics, that I decided that this would be the ideal project to use it in – and I’d get to keep the bag at the end of it – totally owltastic! 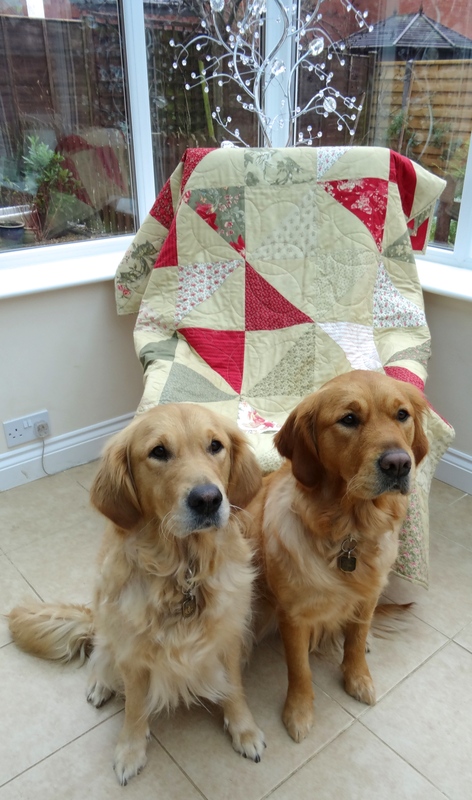 Although the pattern itself isn’t difficult to make, it is quite time consuming – but I’ve certainly found it to be worth the effort involved, as I absolutely love it! 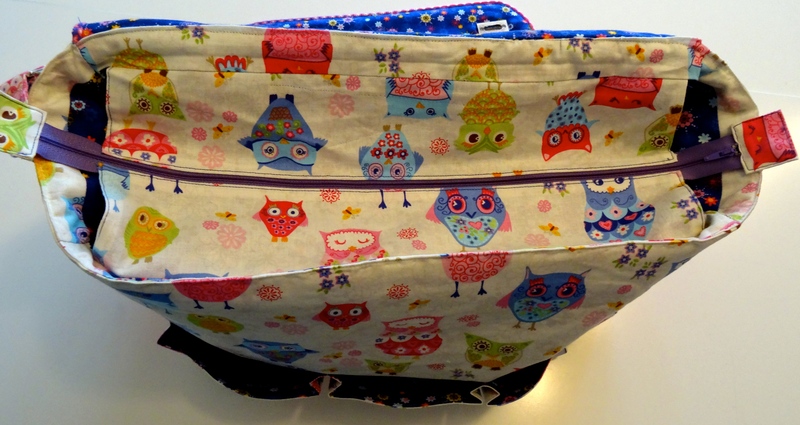 … an interior zipped pocket, as well as bags of room inside for anything else I could possibly think of! 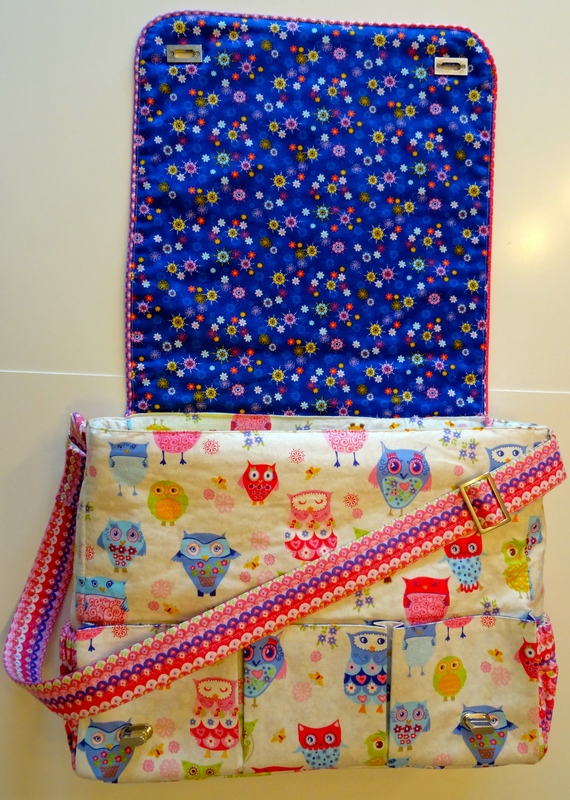 I finished the bag earlier this week, courtesy of my lovely friend Ms C, who popped in to install the bag fasteners for me – way too fiddly for my crappy fingers (note to self – next time, use magnetic snap fasteners, which look a whole lot easier to fit!) I was initially planning to use it on my trip back to the UK this week, as it’s absolutely ideal for hand baggage, but then I looked at the weather forecast and decided that perhaps I’d better wait until there was less likelihood of torrential rain to ruin its newly-finished perfection! My niece, the lovely Miss B, is already casting covetous eyes over this bag, so I may be making another one sooner rather than later, but until then, I shall be enjoying this one all for myself. 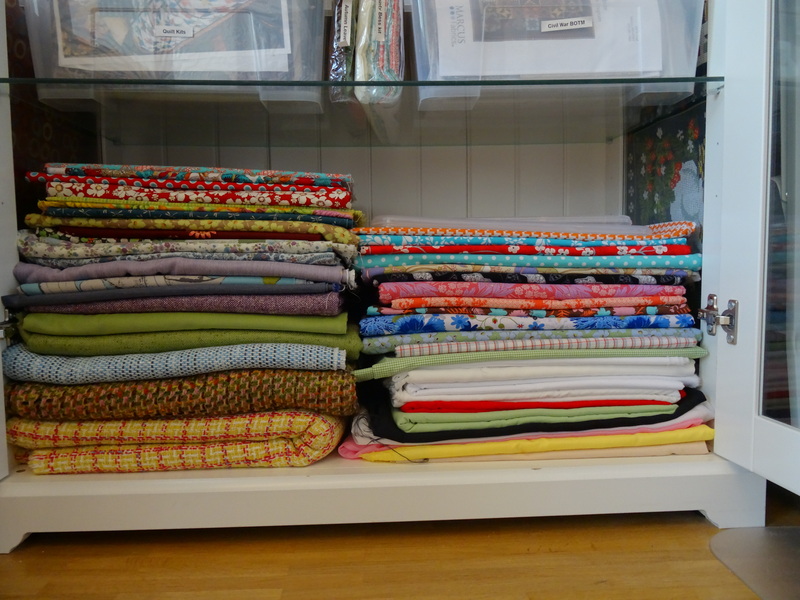 Well, I have been a busy bunny while RR’s been away! 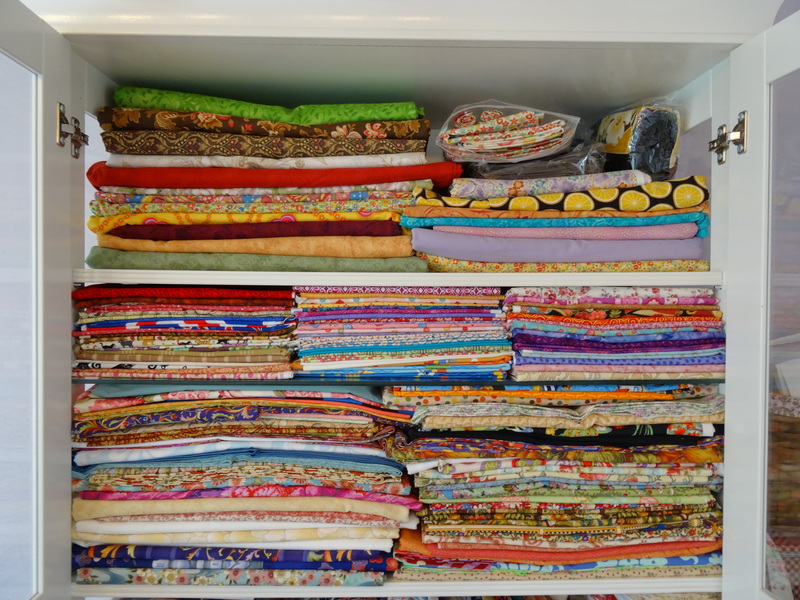 And what a lot of sewing I’ve got done 🙂 I’ve done some hand sewing (my hexie project), some dressmaking (a couple of skirts for our upcoming holiday, amongst other things), some bag-making (the Whole Lotta Bag pattern), and even – shock horror! 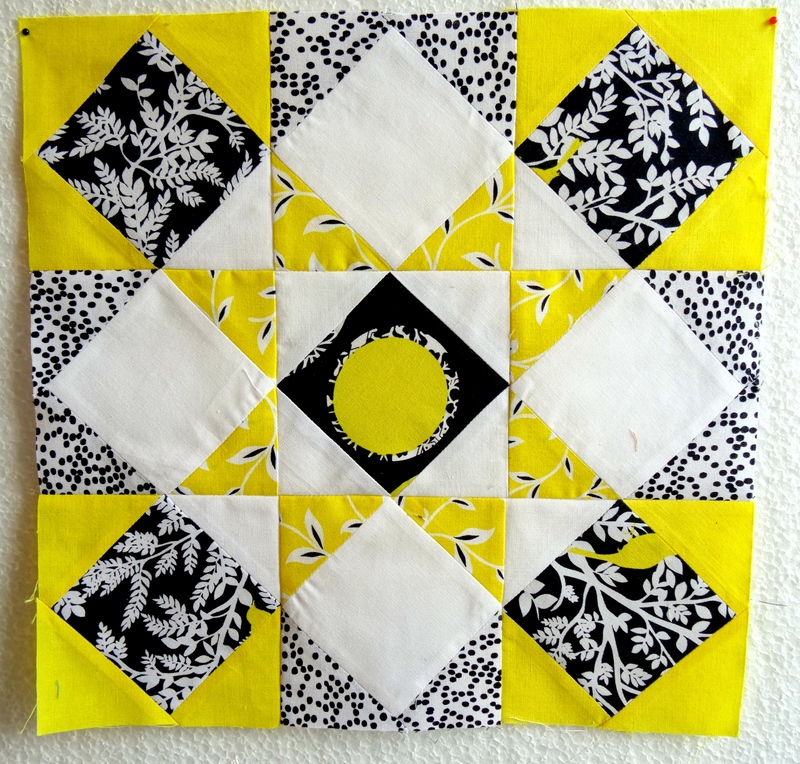 – some quilt block making. 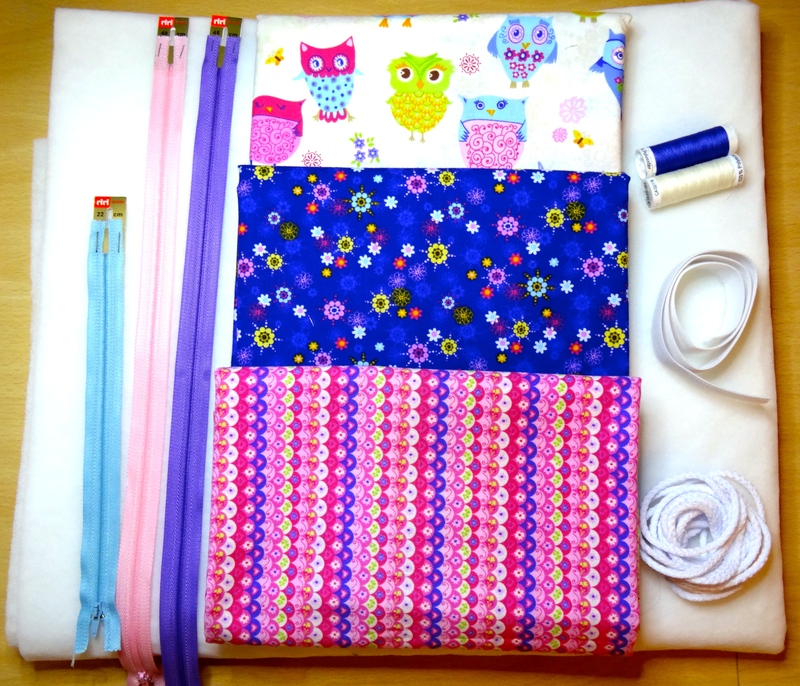 After the Quilt from Hell debacle (of which more will be revealed once said quilt has reached its intended recipient…), I had no real desire to start a new project (even though I have several I need to get to grips with), or even to work on something I already had in progress. What I really wanted was to play with some fabric – and my new sewing machine, too, of course – and what better to play with than my strippy-scrappy quilt in progress? 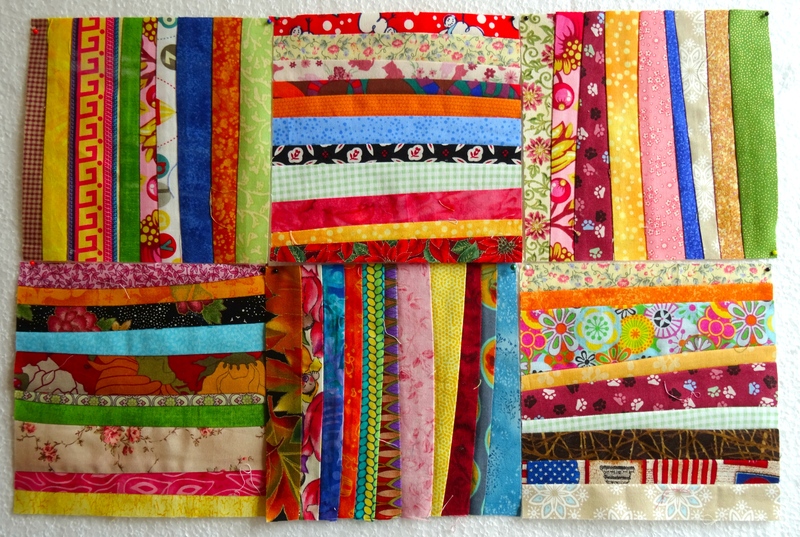 Personally, I love scrap quilts. I love how every piece of fabric holds a memory, of what quilt it was bought for, maybe, or who gave it to me, or where and when I got it. 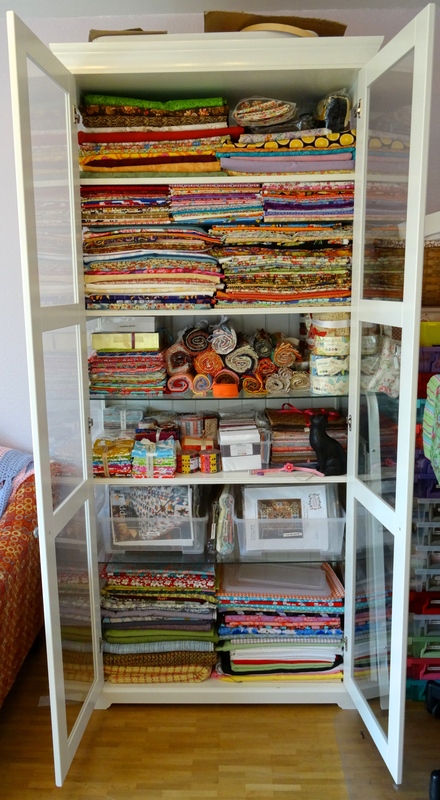 It’s a visual reminder, too, of how my tastes have changed since I started quilting. 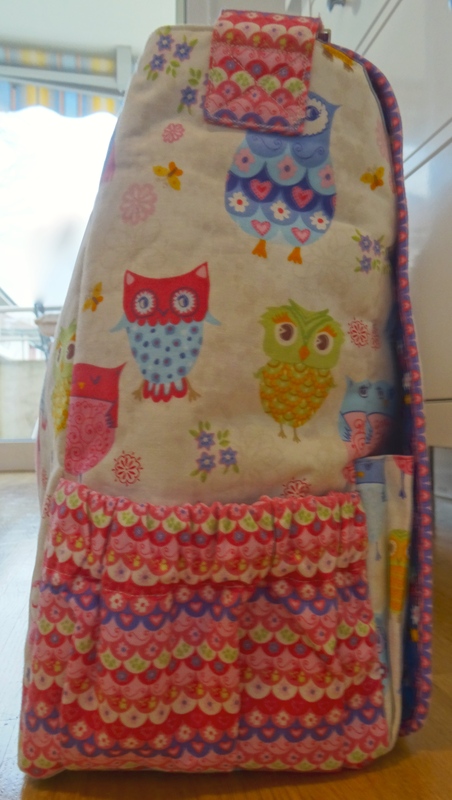 And even if a piece of fabric is just plain ugly (yes, I admit it, I do possess some ‘ugly’ fabrics! ), it never seems to looks out of place in the quilt as a whole. Anyway, being in a reflective kind of mood yesterday afternoon, this was just the ticket. 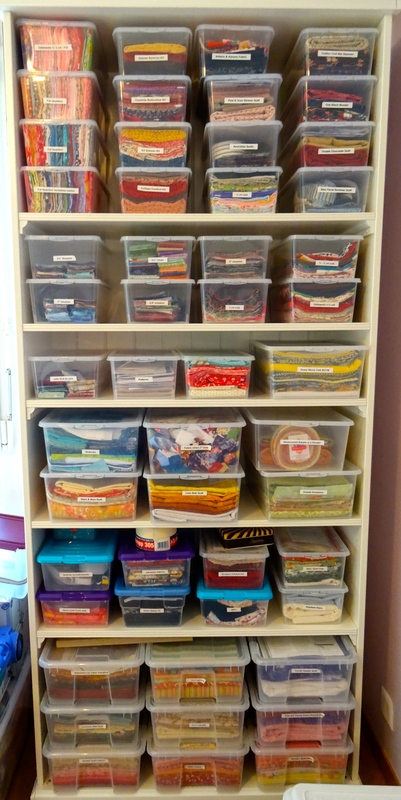 I spent a very happy couple of hours cocooned in my sewing room, Mr. Boy and Mimi Bubba keeping me company, sewing up random wonky strippy blocks. 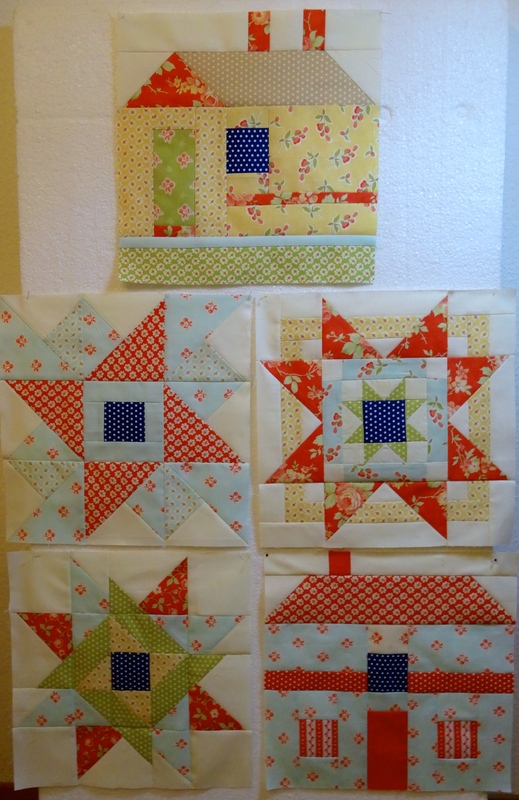 Then I decided to get up to date with my blocks for the two Block of The Month quilts I’m working on, and which had, sadly, fallen by the wayside over the past few months. 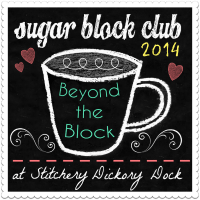 First up, Amy Gibson’s Sugar Block Club over at Stitchery Dickory Dock. 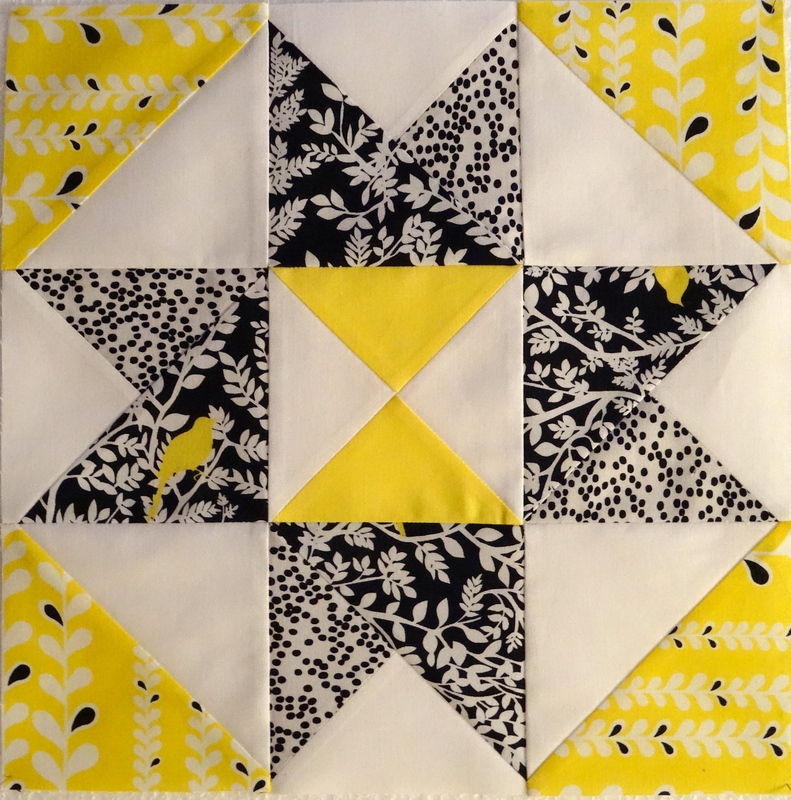 I fell in love at first sight with this fabric line – Taxi by Alice Kennedy for Timeless Treasures – and towards the end of last year, I ended up investing in a half yard of each of the prints, plus a couple of yards of the yellow solid. I’ve been itching to use it for something, and when I saw that Amy had used 2 different background fabrics in her blocks, I just knew it would be ideal for this project. And so far, I’m loving how it’s turning out! 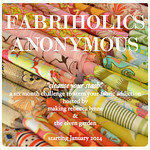 Secondly, I got up to date with my Fat Quarter Shop Designer Mystery Block of the Month. 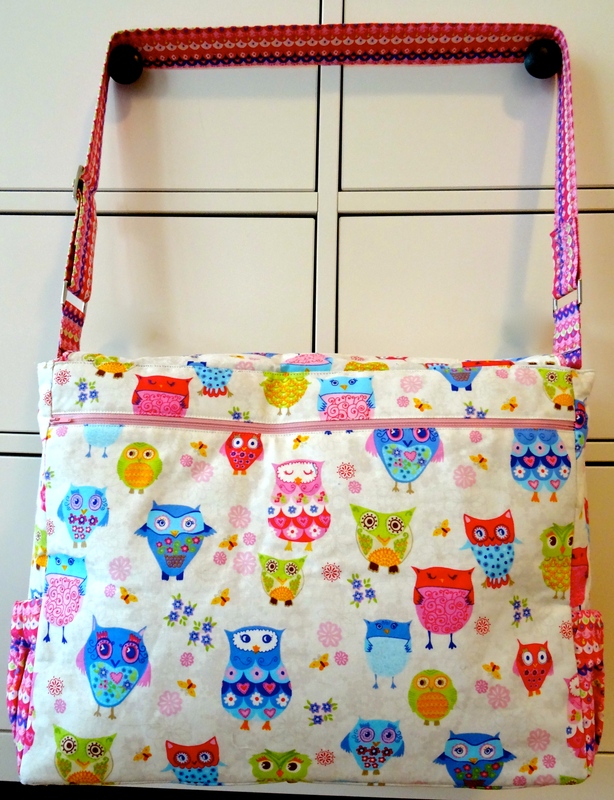 Linking up with WIP Wednesday over at Freshly Pieced. Why not pop over and see what other people have been up to this week?